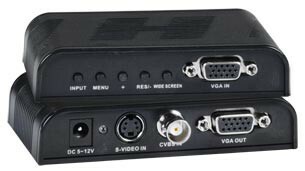 The BNC/RCA Composite Video + S-Video to VGA Converter changes Composite video and S-Video signals from surveillance DVRs, security cameras, quad video processors, etc. into a VGA output for computer monitor displays. Compatible with VGA/SVGA monitors, including LCD flat panel monitors. Adjust video brightness, contrast, saturation, and hue. Auto-saves settings and working status when powered down. Includes a male BNC to female RCA adapter for connecting RCA composite video devices. 4:3 screen: 800x600@60/75Hz, 1024x768@60Hz, 1280x1024@60Hz, 1600x1200@60Hz. 16:9/16:10 screen: 1280x720@60Hz, 1366x768@60Hz, 1440x900@60Hz, 1600x900@60Hz, 1680x1050@60Hz, 1920x1080@60Hz, 1920x1200@60Hz. WxDxH (in): 4.13x2.33x0.90 (105x59x23 mm). 5 ft (1.5 m) S-Video cable included. Male BNC to female RCA adapter included.